Toyobo has various nucleic acid purification kits using magnetic beads as shown below. The following table shows the applications of each product. Detailed information can be obtained by going to the linked sites. Can be applied to extraction of DNA from whole blood specimens. A leukocyte or lymphocyte separation step is not necessary. Does not contain hazardous substances, such as phenol or chloroform. Purified genomic DNA can be eluted in sterilized water. Therefore, the purified DNA samples can be applied directly to other methods, such as PCR, etc. Suitable for high-throughput extraction of genomic DNA from various specimens. MagExtractor -Genome- provides a simple and reliable method for the rapid purification of genomic DNA from various specimens (e.g. whole blood, cultured cells or animal tissues etc) using magnetic silica beads. This kit is based on binding properties of DNA to a silica surface in the presence of chaotropic agents. The purified genomic DNA can be used directly for PCR experiments. Purified genomic DNA can be used directly for PCR. The pretreatment step of this kit is effective in removing polysaccharides. Suitable for the high-throughput extraction of genomic DNA from various plant specimens. MagExtractor -Plant Genome- provides a simple and reliable method for the rapid purification of genomic DNA from various plant specimens, e.g. leaf and cultured cells, etc, using magnetic silica beads. This kit is based on binding properties of DNA to a silica surface in the presence of chaotropic agents. Purified genomic DNA can be used directly for PCR experiments. -Purified total RNA contains primarily rRNA and mRNA. No ethanol is used in the washing steps. Suitable for high-throughput extraction of total RNA from various specimens. MagExtractor-RNA kit provides a simple and reliable method for the rapid purification of total RNA from various specimens (e.g. cultured cells or animal tissues) using magnetic silica beads. This kit is based on binding properties of RNA onto a silica surface in the presence of chaotropic agents　and an RNA-binding accelerator. Purified total RNA contains primarily rRNA and mRNA. The purified total RNA can be used for RT-PCR experiments. Suitable for the high-throughput extraction of viral RNA from serum or plasma specimens using magnetic silica beads. Does not contain hazardous substances such as phenol or chloroform. MagExtractor -Viral RNA- provides a simple and reliable method for the rapid purification of viral RNA from serum or plasma specimens using magnetic silica beads. This kit is based on the property that RNA can be absorbed onto a silica surface in the presence of chaotropic agents and an RNA-binding accelerator. The purified viral RNA can be used directly for RT-PCR experiments. Typical plasmid yield from an E. coli cell line carrying a high-copy plasmid is approx. 3-6 μg. Suitable for high throughput extraction of plasmid from E. coli cells. The extraction time is 10-15 minutes. Purified plasmid can be applied directly to sequencing, enzyme reaction, transformation, etc. MagExtractor -Plasmid- provides a simple and reliable method for the rapid purification of plasmid DNA from E. coli cells utilizing magnetic silica beads. This kit is based on binding properties of DNA to a silica surface in the presence of chaotropic agents. The purified plasmid can be used directly for automated fluorescent sequencing. Extracts DNA fragments from ≤ 100 μl PCR solutions or enzyme solutions (e.g.,restriction enzyme and alkaline phosphatase) within 5 minutes. Extracts DNA fragment from ≤ 0.3 g agarose gel slices (TAE or TBE) within 15 minutes. Agarose slices can be melted at room temperature; it is not necessary to use a heating block. Typical yields from solution or gel slices are approx. 60-70%. DNA fragments approx. 100 bp to 50 kb can be effectively recovered. Small fragments (< 40 bp) are removed. Purified DNA fragments can be applied to sequencing, restriction enzyme treatment, labeling, ligation, transformation, etc. 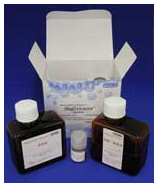 RI-labeled probes can also purified with this kit. 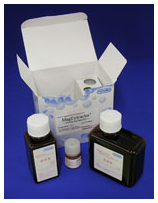 MagExtractor-PCR & Gel Clean up- provides a simple and reliable method for the rapid purification of DNA fragments from a PCR solution, enzyme solution, or agarose gel slices utilizing magnetic silica beads. This kit is based on binding properties of DNA to a silica surface in the presence of chaotropic agents. 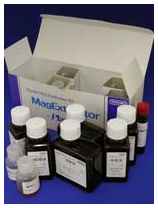 The purified DNA fragments can be used directly for general molecular biology experiments. 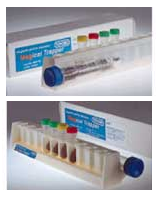 Magical Trapper is a magnetic particle concentrator for use with various kits containing magnetic beads. The product is designed to hold ten 1.5-2.0 ml-microcentrifuge tubes in the front side and one 15 ml-centrifuge tube in the back.